Squash users will have been upset to receive a letter from One Leisure informing them that the courts in St Ives are closing on May 19th 2019. The club will do our utmost to ensure squash continues in St Ives. We will enter into discussions with One Leisure the council and other stakeholders to try to reverse this decision. In the meantime, clubnight continues every Monday and we will put on some events in the coming months. Details. GRADED SQUASH OPEN TOURNAMENT - SUNDAY 12TH MAY AT THE OUTDOOR. Details. JOIN ST IVO RACQUETS CLUB FROM ONLY £10. 2018-9 memberships now available. Details. Squash and Racketball Club Night is on Monday nights from 7.40pm, resuming on the 7th January 2019. All welcome. 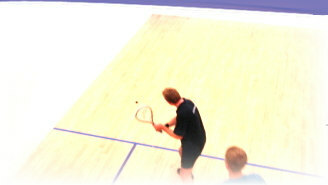 The St Ivo Squash Club Championships will be rearranged for late April/early May, watch this space. This will be a knockout tournament with plate. Monday 1st April 2019. Attendees will be entered into the tournament. Cost £5, please contact Byron to enter. Details. The team runs 2 mixed squash teams and 1 racketball team in the Cambridgeshire and Peterborough leagues. Members can enter the box leagues by signing up on the noticeboard at the centre. Latest news, video, and match updates can be found on the new twitter page. St Ivo squash club is based at the One Leisure outdoor centre, St Ives, and offers the opportunity to play squash and racketball in a friendly, family orientated atmosphere. Whether it's the odd social game, the enjoyment of learning a new skill, or pushing your fitness levels to new limits the club offers the perfect environment to hone your skills. The club aims to make squash accessible for all, and with monthly box leagues for abilities ranging from beginners to advanced, you'll enjoy the opportunity to play fellow members of a similar standard and make new friends. We also encourage members to participate in the growing sport of racketball, an exciting derivative of squash. Equipment can be obtained through the club, so anyone can try this enjoyable sport. We hold squash and Racketball club nights on Mondays at 7.40pm. Club nights are open to all, and it's an excellent chance for players to have a friendly game with players of all abilities. The club also hosts tournaments, enters teams in the county leagues, and puts on social events for members. If you think this sounds like the club for you, see our How to join page for more details.